It’s not secret that avocados have great benefits. If you don’t know what we’re talking about, check out Subway’s latest commercial and avocado promotion. Avocados have antioxidants that protect your vision, good-for-you monounsaturated fats which keeps your heart healthy, and fiber to fill you up so you actually feel full. It’s a fantastic “flat-belly” food. Sold yet? Well if you are looking for ways to incorporate avocados in your diet, here are our favorite ways to enjoy this super food. 1. Plain Jane: That’s right, eat it as is. Many people either slice it up or just halve an avocado and enjoy the natural flavor! If you want to switch it up, sprinkle just a tiny bit of salt on it for an added punch to the flavor. 2. Smeared: Try using avocado in place of mayonnaise or cheese in your next sandwich. It helps lighten the calorie content, while adding 20 vitamins and minerals to your meal. Not to mention the consistency could easily be mistaken for the goodies you replaced it for. 3. Smoothie: We’ve all seen those scary green shakes. In reality, they’re not that bad. Since they mostly contain green foods that have no distinct flavor of their own, whatever berry or fruit you add to the mixture dominates your taste buds. 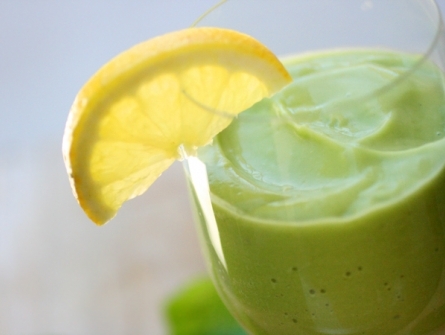 Mix up a smoothie of spinach, avocados, yogurt, and bananas for a snack or meal full of goodness! 4. Martini: You can either make this at home or see if your local martini bar can mix this up for you. It’s a combo of fresh lime, basil, mango vodka, rum, and avocados served ice cold. 5. Guacamole: Who doesn’t love a good guacamole? Just make sure it doesn’t have too many added ingredients and enjoy this delicious dip on your tacos, salads, or with tortilla chips!